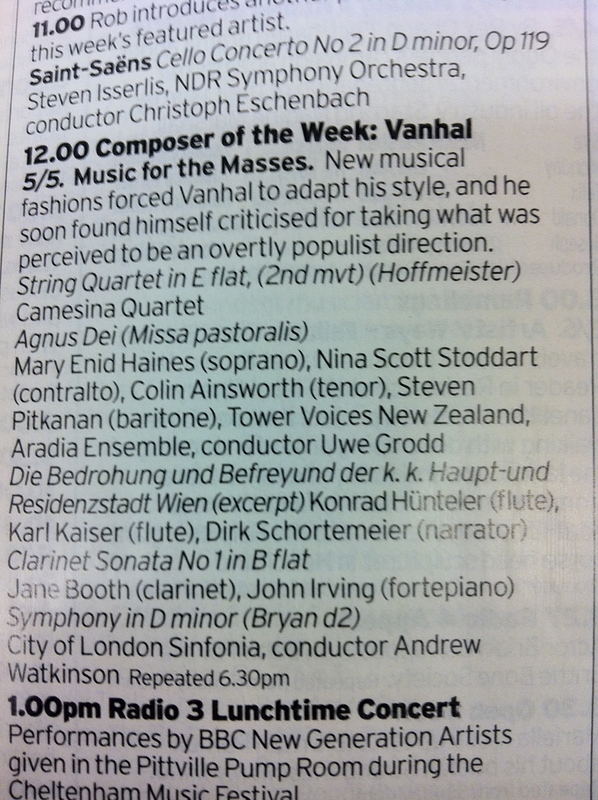 Ensemble DeNOTE’s recording of Vanhal’s complete works for clarinet and piano will feature on BBC Radio 3’s Composer of the Week, 12-1pm on Friday 2 October. Jane Booth (clarinet) and John Irving (fortepiano). The recording was made in 2012 at Salomons in Kent, and released during 2013 – the 200th anniversary of Vanhal’s death. Composer of the Week will feature our performance of Vanhal’s Clarinet Sonata no.1 in B flat. Vanhal was one of the earliest composers to write sonatas for the clarinet. In fact, varied scorings of some of his three sonatas were recorded in contemporary documents, with manuscript sources surviving that list viola and even cello as alternatives!